Lee Loader • View topic - SMLE Half Magazines! Yea! 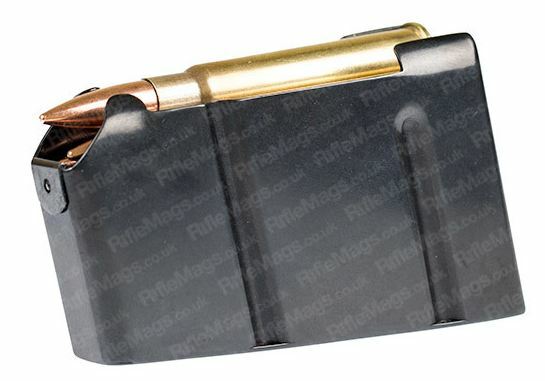 RifleMags.co.uk got their stock of 5 round magazines in for the No 4 & No 5. They are expensive but I don't care. I dislike the 10 round in that my Scout is a hunting rifle, it is always in the way. Just ordered mine. Thanks for the link. Expensive, but from what I read on Enfield rifles, worth the money. 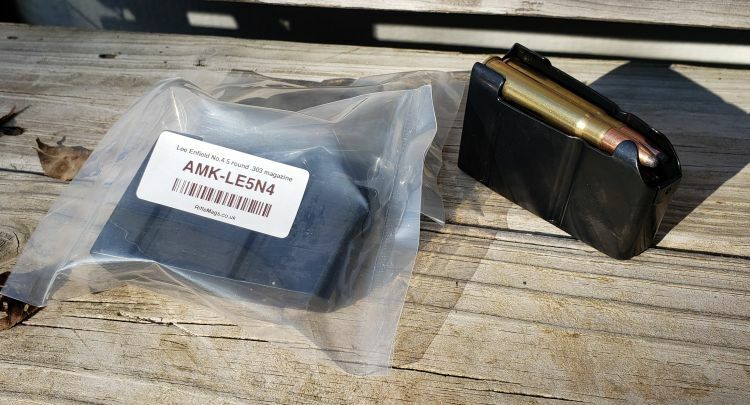 I bought one that was listed on eBay, used a picture similar to that above, but when I received it, it was a 10-round with some kind of block in it. It was a much as these, I was a bit upset when I contacted the seller. Of course, eBay is good when it comes to satisfying the buyer. I received the magazines today. Exactly what I was looking for and well worth the money! It has just enough of a lip that you can grab it to pull it out vs. pushing it out through the receiver. Now, I can walk with my scout rifle at its balance point! Finish and feed on the first one opened is excellent. I went to riflemags.co.uk to leave a review, but it doesn't look like the site is set up for them. Too bad, these are very nice. I noticed that they only have four left in their inventory, I'm glad that I bought three. Got mine today. Well made and finished. Had a bit of trouble getting it to mount in rifle. Not a biggy as it could be my technique as once in it is nice and secure. Haven't tried to load some rounds yet as I have a rule about not loading live rounds into a firearm except in a safe location. I compared it to my two military mags and it looks identical. What chambering is your Enfield in, original .303 ? Et2ss wrote: What chambering is your Enfield in, original .303 ? Mine is as I believe is RD's. Straight up, old school, 303 British. Macd, the first time I inserted the magazine it was tough. I had to push it out through the well. I coated it up with the gun oil I use and pushed it in and out a dozen times or so, wiped it off and reoiled it about halfway through. I noticed up at the range; it was a very good fit. That's a slick looking set up. I have only done the opposite with Enfields.......found orphaned 'sporters' and did my best to restore them back to military trim. As a matter of fact I have a 'back burnered' No 5 that's sitting with all the pieces to restore it. It's been sitting now for about 8 years waiting on me. I had thought about finding an unsalvageable one, and rebarreling it to 45-70, similar to those done by Gibbs back in the 90's. I guess when it really gets down to it, my interest is in the deer rifles that I grew up around. Hunting was and is a big thing in South Texas, but there was not a lot of money for rifle and most hunters only had one, to have more would have seemed extravagant. Besides the levers, I like the working man guns. Savage was actually really good at this; the 99s, 340, and 170s. Sporterized SMLE as well more than any other surplus offering. My SMLE Scout is to mess with the Ruger Scout guys. Let's seem them zip 10 rounds from two chargers into their empty magazines!